During the day the light in Asia is hard with too much contrast so you are not able to get a decent image. You have to work inside the houses with the light what is available. I almost never use flash or artificial light because I try not to disturb people in their daily activities. Nowadays the possibility of using high ISO values is really the solution to shoot inside. In the added images I want to come close to what is often called the Dutch or Rembrandt light. All of them are made in Myanmar and in the coming posts I will also show other countries. 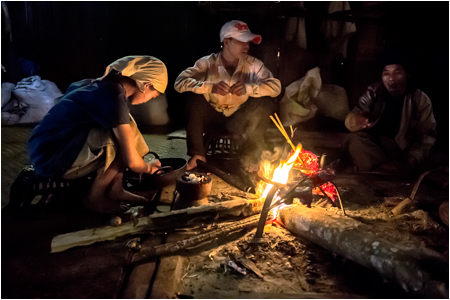 Chin woman preparing the meal in her house in the Chin village Kyar Hto near Mindut. A boy in a cottage in a small village on the way from the airport to Mandalay. This young Chin woman (around 20) has tattoo on her face. This is remarkable because it is forbidden for already more than 20 years. 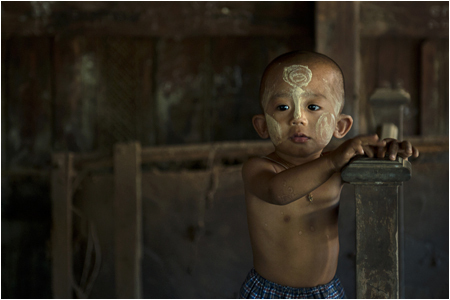 A young boy with thanaka on his face in a cottage near the wooden monastery Nat Htaung in Bagan. A fire in a long house which can be occupied by 10 families with 60 persons. 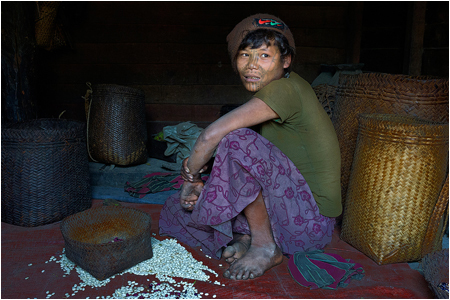 This small village Wan Lone is hours walking from the main road to Kyaing Tong. 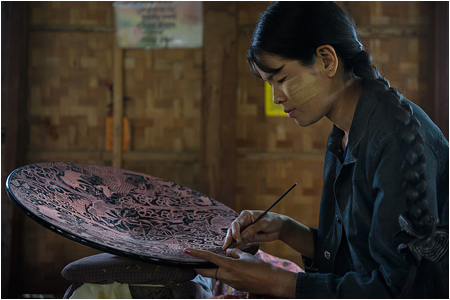 A woman with the name Ma Cho Mar is working in a small laquerware workshop called Tun in Bagan. 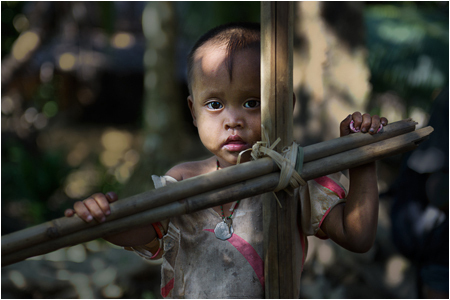 This image is shot outside between the trees in a Chin village Panpaun on the river Lay Myot (also running along Mrauk U). 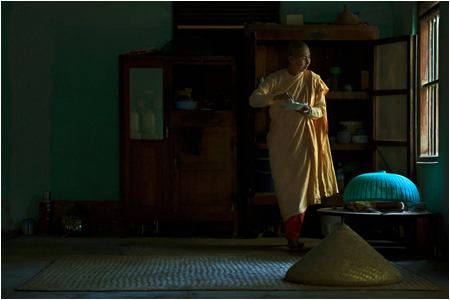 A nun having her late afternoon meal in a nunnery in Bagan. 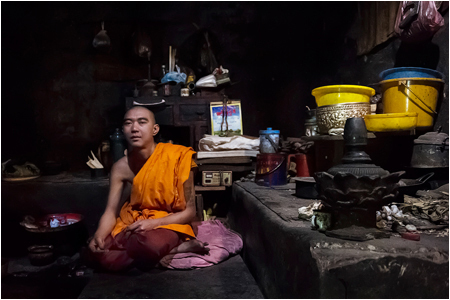 A monk is his room in a monastery in Mandalay. 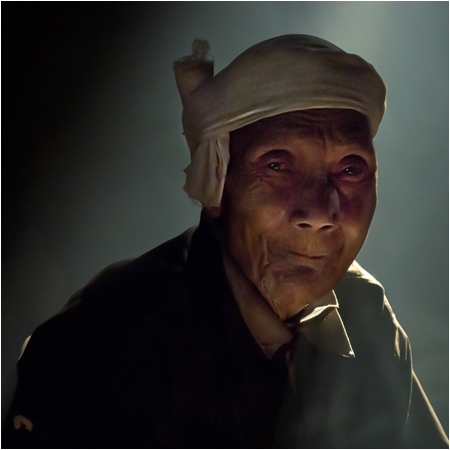 An old man living in a long house in An Lone using the light from a hole in the roof. Erny, weer mogen genieten van je prachtige foto`s. Dank! Weer prachtige foto’s lieve Erny. Ja wat een genot, die hoge lichtgevoeligheid van de digitale camera’s. Tegenwoordig zelfs steeds meer zonder storende ruis/noise. Mijn Eos 6D laat zelfs 102400 ASA toe. Met een 60ste uit de hand bij kaarslicht. Whaw. Ik heb ook een grondige hekel aan flitsen. Die sleepte ik alleen maar mee. Flitsen, is voor als het echt niet anders kan en dat is nu bijna nooit meer. Het Vermeer rijstmeisje uit Bagan!! Wil. Weer erg mooi, spelen met licht! Erg talentvol! Gewéldige foto’s van een mondiale topkwaliteit! Kwaliteit foto’s ! Prachtig licht maar de sfeer vindt ik het belangrijkste en die is heel mooi . Kortom Top ! Dank dat ik de foto’s mocht zien. Mooi licht Erny en geweldige sfeerfoto’s.